Most forward thinking organizations today realize the value of a customer relationship management program to achieve increases in revenue, profitability and customer satisfaction, and today the Internet can provide that avenue to develop and strengthen their customer relationships. Professional sports teams have not yet taken advantage of the capabilities of the Internet to manage their customer/fan relationships, and this research will demonstrate how a professional sports team can successfully use the Internet to manage and develop their fan relationships.By developing an electronic Fan Relationship Management (e-FRM) program, a professional sports team can develop long term relationships with its fans around the globe. 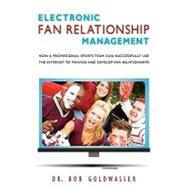 In this eye-opening book, Dr. Bob Goldwasser establishes that a strong e-FRM program must include a team web site full of interactive features, an email and text messaging fan outreach program and in-game enhancements using the Internet, and if implemented Dr. Goldwasser demonstrates that fans are more likely to visit a team web site and more likely to attend future games. An aggressive e-FRM program will engage avid sports fans and will entertain the occasional fan. Dr. Goldwasser challenges every professional sports team to use the Internet to increase fan retention and loyalty and to enhance the fan's game experiences, thus building long term relationships with their fans which will positively impact the team's profitabilty.